The 20-hour queue: How long will a Russian wait to see a relic? Some queues even stretched for eight kilometers. For the first time in history, relics of St. Nicholas were delivered from Italy to Russia to be displayed in the Moscow’s main cathedral - and it seems Russians will go to any lengths to catch a glimpse of the sacred remains, which are believed to bring good luck. 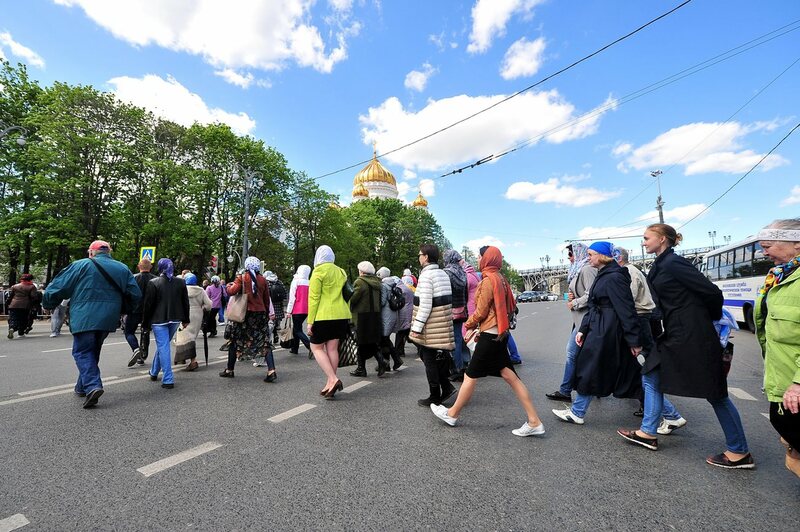 By 10:30 a.m. on May 22, a mile-long queue stretched from the entrance of Russia’s main cathedral – the Cathedral of Christ the Saviour in Moscow. For the first time in history, the hallows of the revered Christian saint, St. Nicholas, were delivered to Moscow from Bari in Italy, where they laid untouched for a millennia. Such a sight is by no means rare in Russia. Historically, people have always been eager to spend countless hours in line just to glimpse Christian relics, and there will certainly be more prepared to wait in the future. Over the next month, millions of pilgrims will descend on the Russian capital and endure seemingly endless queues outside the Cathedral of Christ the Saviour, to pray to the hallows of St. Nicholas. Nicholas lived in the Asia Minor region in fourth century BC and is one of the most revered saints in the Christian world. He is commemorated across all Christian confessions, even becoming the proto-figure for Santa Claus. However, Russian people traditionally viewed him as the protector of the poor and the patron of repentant criminals, children, and students. Known in Russia for his miracles as Nicholas the Wonderworker, the figure of St. Nicholas transcended the mere status of the saint and became the symbol of hope for all those seeking spiritual guidance and protection. “Russian people revere St. Nicholas very much, more than any other saint. He’s a saint who helped people both in life and in death, no matter who you were. In prayers to him, people find help,” Alexander Volkov, the press secretary of the Patriarch Kirill of Moscow, told RBTH. “It’s very important for a Russian to personally commit to a physical endeavor, a sort of act of martyrdom. Russians know that by braving the queues, they will gain something for themselves, for their soul. It’s beyond rational thought; it’s on some mystic level,” added Volkov. It’s not the first time an Orthodox relic of such significance has brought together Christians from the far corners of the former Soviet Union. In November 2011, people spent up to 20 hours in line, waiting to venerate the Cincture of the Blessed Virgin Mary, which was delivered to Russia from Greece. The estimated number of pilgrims who came to see the relic as it travelled across several Russian cities was more than three million. Reports claimed that some queues even stretched for eight kilometers. “Whenever I talked to people who waited countless hours to see the Cincture of the Blessed Virgin Mary, I always got the impression that these people shared a mutual feeling, a special feeling of awe before a Christian relic… A longing for a miracle and consolation,” Sergei, a priest from one of Moscow’s churches, told RBTH. The Orthodox faith has deep roots in the traditional Russian mindset. Saints have always been important figures for Russian Christians. A place where a saint lived would become a place of worship, and sometimes developed into a monastery. Personal belongings of the saint were attributed great religious importance, and were often used in court ceremonies and as blessing tools. The saints themselves served as nothing less than miracle-makers, who would cure illnesses and set stray souls on righteous paths. That said, even nowadays an event like delivering the remains of the St. Nicholas to the capital has great historical and cultural significance for a huge number of Russian people. A priest from one of the churches in the Moscow region, who wished to remain anonymous, talked about his personal experience, recalling how some people in his congregation view saints “as an easy way to solve their problems. “Like any Russian, I am lazy. I want a freebie. Say, I know that this particular saint has touched God; he transcended his human form and was able to see eternity… Sure, if I touch his remains now I will be saved too and all my troubles will perish. We do it for the same reason we jump into ice cold water during the Epiphany.